Ranch Pratt, president of UROC, is perhaps the most controversial figure in rocksports. He has led sponsors, competitors, and course designers through an emotional rollercoster during his tenure at the head of ARCA, RCAA, and UROC. 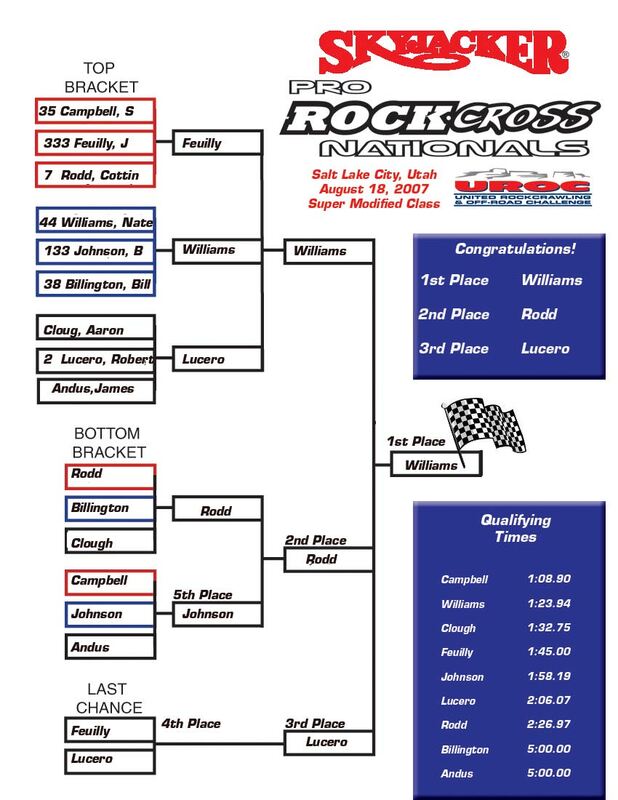 Only weeks before UROC's 2007 rockcrawling season was slated to begin, Pratt issued a press release stating that UROC had abandoned rockcrawling competition in favor of a new format dubbed RockCross. 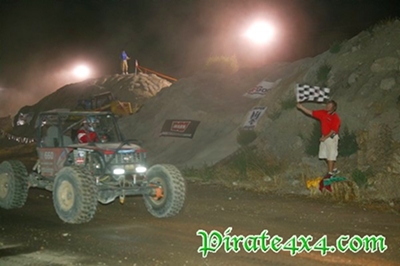 With WE Rock and XRRA's seasons both well under way and flourishing, Pirate4x4 headed to Salt Lake City in mid-August for the UROC RockCross season opener with more questions than answers. Would competitors show up? What would the courses look like? Returning to the location where Nick Socha nearly lost his life during Supercrawl III, would safety be a concern for drivers and spectators? After the departure of big name sponsors, could UROC keep their remaining supporters happy? Our first question was answered immediately. In contrast to the lively drag racing and packed motocross course at the Rocky Mountain Speedway, tech inspection for the RockCross looked like a ghost town. There was not a sponsor in sight and "staff" consisted of Ranch Pratt and his mother, who were not overwhelmed with the small number of competitors. 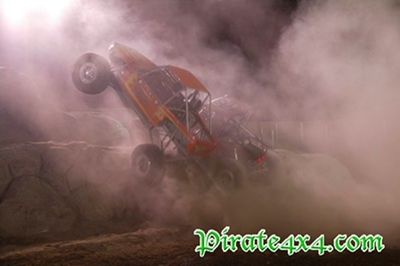 The field was limited to eighteen vehicles overall, split evenly between the Super Modified and Modified classes. Compare this to the last WE Rock competition, which had thirteen competitors in the Formula Toy class alone. As this was a new format, Pratt explained that he purposely limited the field in order to allow events to proceed in a timely manner. While there were few competitors, Mother Nature made an appearance Saturday morning, with dark skies and high winds greeting us at the driver's meeting. Scanning the crowd, we realized that at least one of our fears was unfounded. The competition would not be made up of Salt Lake locals in lifted half ton trucks. On the contrary, big names like Shannon Campbell, Brad Lovell, and Joachim Schweisow were all present and eager to maintain their past success in this new form of rocksports. 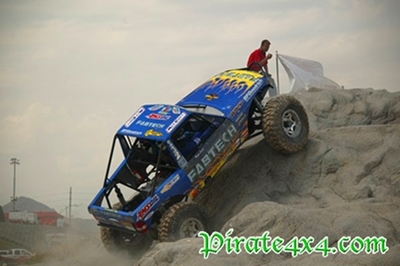 Many of the competitors, like Campbell, were running the BFGoodrich Krawlers that they use at rockcrawling events. 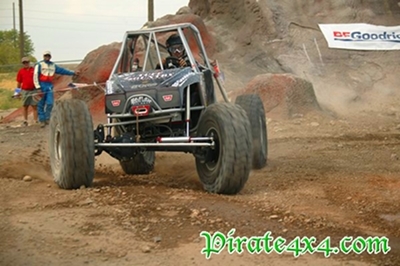 Maxxis and Toyo were represented as well on vehicles piloted by drivers like Cottin Rodd and Clay Egan. 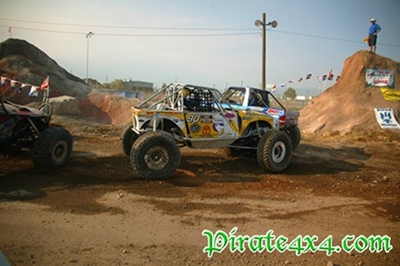 Joachim Schweisow chose to run prototype Frankenstein BFGs with a Baja carcass, CORR tread pattern, and sticky compound. 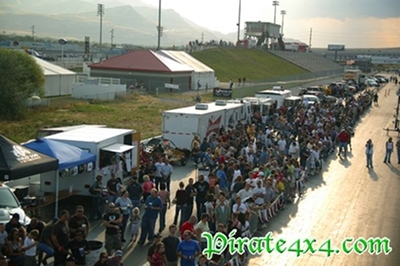 Qualifying began at 9 AM in front of deserted bleachers at Rocky Mountain Raceway. Each driver was allowed to run one practice lap, and then made one pass against the clock. The course utilized the same obstacles used during Supercrawl III on the first manmade rockcrawling courses. Steep climbs and technical sections were combined with fast dirt straight-aways and tight J turns. Qualifying took its toll on many competitors; Bill Billington broke a coilover mount, Carl Nielsen rolled, RJ Brown rolled hard, Clay Egan rolled twice, and Nate Williams had a spectacular roll that he tried to save for several minutes (or at least it seemed that long). If competitors were rolling when racing against the clock, we were concerned about the outcome when they were three wide going in to a corner. In contrast to the rollovers, Shannon Campbell was blistering fast, posting a time 15 seconds faster than the next closest Super Modified driver. Local and relatively unknown driver Jim Maybe set the fast time for the Modified class and was actually faster than all Super Modified competitors, save Campbell. Qualifying was completed around 1 PM, at which time Pratt ran another driver's meeting. Details such as banners, number of laps, and how to deal with rollovers were somehow still open to discussion during the middle of the event. After everyone said their piece, Pratt decided to run three laps per heat and allow banners to be hit. 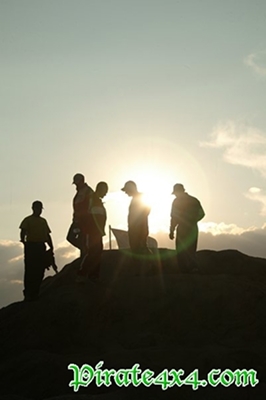 Flagmen would be on the course to stop the action in the event of a rollover or other dangerous situation. With so many details left unresolved and no fans in the stands, it seemed as though RockCross would be dead before it was even born. When we returned for the main event at 6 PM, it was as if we had entered an alternate universe. The weather had lifted, and with it UROC's fate. Vendors lined the speedway and spectators packed the stands. 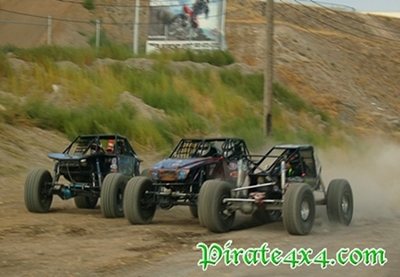 Following the national anthem the action started immediately with the first heat in the modified class. Clay Egan, Brad Lovell, and Jim Maybe all scrambled up the first climb side-by-side. The vehicles were still grouped together as they rounded the second corner, where Egan plowed into the side of Lovell. The fans were eating it up and we started formulating our apology for doubting Pratt. But before the first lap was complete, Maybe had broken a driveline and Egan had rolled, leaving Lovell to win by default. The fans scratched their heads, wondering if all of the races would be decided by the last car running. The second and third races did nothing to calm their fears, with Ben Hanks losing a knuckle in the second heat and RJ Brown breaking in the third heat. This allowed Craig Stumph and Joachim Schweisow to move into the semifinals with little effort. The action then shifted to the Super Modified class, with Shannon Campbell and his LS1 powered moon buggy lining up against the Jimmy's Outback 4x4 built buggies of Cottin Rodd and Jason Feuilly. Campbell jumped out to an early lead, but squandered it when he rolled on the second technical section during the first lap. This was the biggest surprise of the night thus far, but the format specifies double eliminations and after watching the qualifying rounds we knew that the only person who could beat Shannon Campbell was Shannon Campbell. The races continued much as they had earlier, with attrition taking out most teams before they could reach the checkered flag. Fueilly won the first round, Nate Williams won the second round after Bill Billington and Brandon Johnson broke, and Robert Lucero advanced over James Andus and Aaron Clough. It took several hours to run the first round for both classes, but the crowd did not thin as the sun dipped in to the Great Salt Lake. Their patience was rewarded when the Modified class returned for the semi-finals. Lovell lined up against Schweisow and Stumph in what might have been the best race of the night. Lovell jumped out early, but the other two were right on his tail. 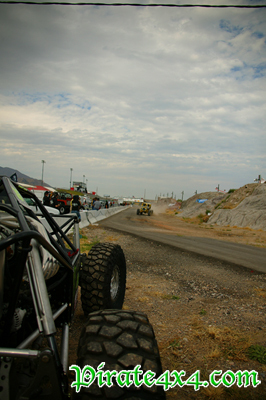 Stumph's buggy shined in the technical sections with its low gearing and sticky Krawlers, but it bounced off the rev limiter once he reached the open sections of the course. Alternately, Schweisow's LS1 and stiff sidewalled tires allowed him to pilot his Twisted Customs buggy like a rally car in the fast portions of the course, but it was at the expense of traction on the rocks. All three stayed bunched up for the entire three laps, much to the delight of the crowd. In the end Lovell had what it takes to stay out front and win. 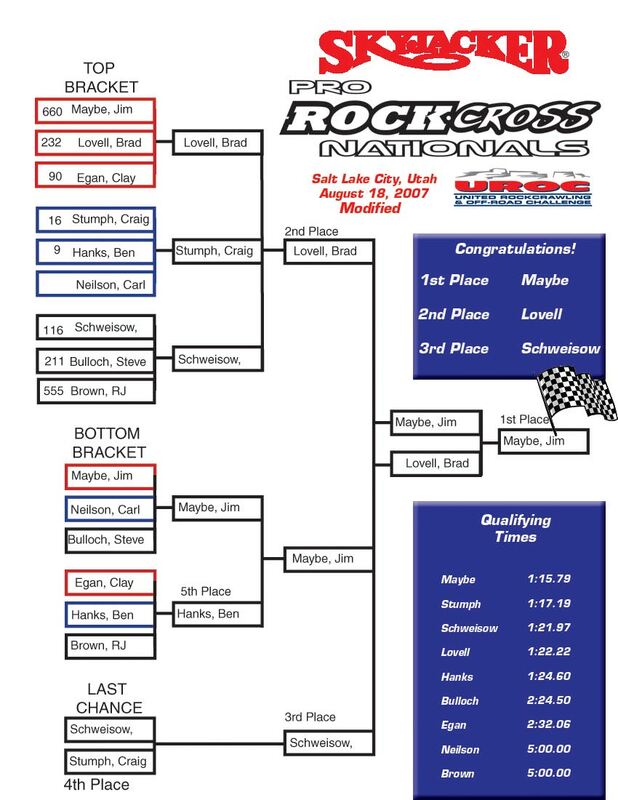 Jim Maybe replaced his driveshaft and Ben Hanks fixed his broken knuckle from the first round to win their races in the losers' bracket before going head-to-head. This was another great race with both drivers going all-out as they rounded the course. We were starting to see a glimpse of RockCross's amazing potential and fan appeal. With few spots to pass, Maybe beat out a hard charging Hanks to continue to the finals. The Super Modified lined up again with Fueilly, Williams, and Lucero in the winners' bracket. Amped from the previous round, all three charged out of the gates. Lucero got bumped and turned turtle early in the race, bringing out the red flag. Williams had a big lead on the restart, and Fueilly got overly aggressive trying to reel him in and went wheels up, smashing his A pillar hard. Rodd then beat Billington and Clough to advance to the semi-finals. Not to be outdone, Campbell, Johnson, and Andus made a land rush start towards the first obstacle. Contact was abundant and Campbell rolled immediately with some help from Johnson. The red flag came out again and a restart took place without Campbell. Johnson won, but after reviewing video after the race Johnson admitted that he contributed to the roll and agreed to rerun against Campbell. UROC's rules state that "While vehicles will, from time to time bump, it is not allowed as a means of competitive advantage." This is certainly subjective, but we applaud Johnson's willingness to run against Campbell again. In the end the results were the same, as Campbell's buggy suffered a broken air compressor, saddling him with open differentials. Johnson then faced Rodd, who beat him to the first climb and was able to hold on to the lead for the entire three laps. Rodd seemed to have the course dialed going into the finals, using the perfect combination of finesse and throttle. She was a crowd favorite as well, further adding to her momentum. It was well into the night before the Modified Class lined up for the finals. Pratt's decision to limit the field was starting to look like a wise one. Lovell, Schweisow, and Maybe lined up for the last time (or so we thought). Schweisow was not willing to give any ground in the outside and ended up rolling on the first obstacle, as many had done before him. Landing back on the tires, he never hesitated and kept right on going. He was able to pass Lovell after a roll on the backside of the first corner on lap two, but Maybe was just too fast. Because the format is double elimination, Schweisow still ended up in third and Maybe ran against Lovell again since the latter had only lost once thus far. The momentum had already shifted to Maybe, who had gained plenty of confidence by this point and proved that his fast time in qualifying was no fluke. Lovell seemed somewhat rattled by his roll and the tie breaker ended the same as the previous race, with Lovell's tires in the air and Maybe taking the checkered flag. Spectacular results considering that local Maybe only decided to compete the morning before the event. After clearing the course, Rodd, Williams, and Lucero lined up for the Super Modified finals at 11 PM. The crowd had thinned significantly at this point, but the competitors still gave it their all. Lucero jumped out to an early lead, but Williams stayed on his tail and made a bold pass at the beginning on the second lap. Lucero kept right on his bumper, looking for an opportunity to pass. Perhaps he was focusing too hard on the pass, as he rolled on the last obstacle, allowing Rodd to sneak past and take second to Williams, who was the only undefeated competitor at the event. The Super Modified finals showed the potential of this emerging sport, but holding the grand finale at nearly midnight highlighted the long road that Pratt has to travel to take RockCross to the next level. With no safety issues in Salt Lake City and a big spectator turnout, the event can certainly be hailed as a success. The next event in Pomona offers even more potential as Pratt has a blank canvas for course design and is ensured a large crowd since the competition is being held in conjunction with the Off-Road Expo. 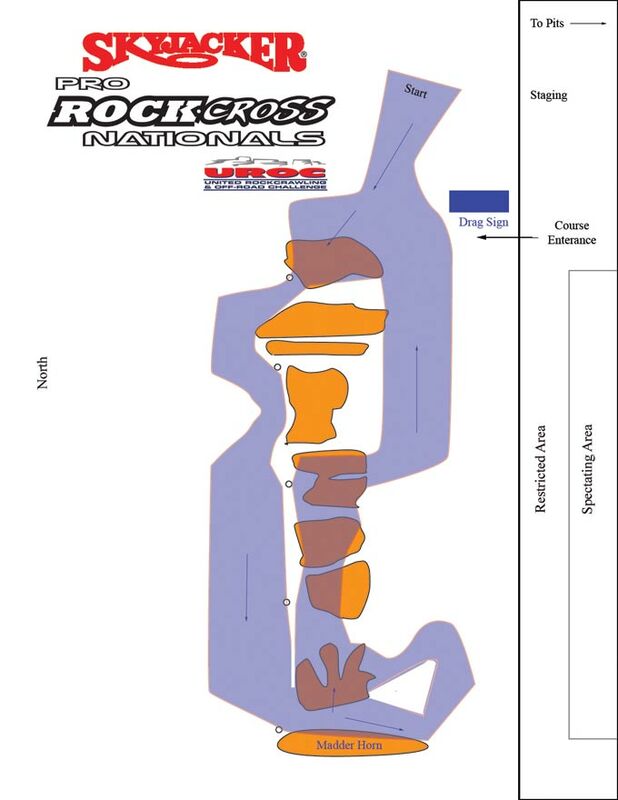 Improving logistics, course design, and clearly defining the rules will go a long way toward allowing UROC to realize the potential displayed at Rocky Mountain Raceway.